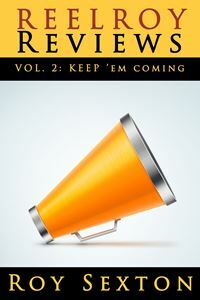 This isn’t a review. If anything it’s an ode to a phenomenal local professional production of the Pulitzer Prize-winning musical Next to Normal. I had seen a few numbers from the Broadway production of this challenging show on the 2009 Tony Awards, and I promptly bought the two-disc cast album, but I had not yet ever had the privilege of seeing it. Next to Normal, with music by Tom Kitt and book/lyrics by Brian Yorkey, details in rock opera form the travails of a young couple as they careen toward middle age, navigating Yuppie-dom, petulant teenagers, and a predilection for making sandwiches on the kitchen floor. A traumatic cloud hangs over their McMansion, the truth of which is revealed M. Night Shyamalan-style toward the end of the first act. This narrative context – which shares its genetic code with such tragic familial dramas as The Subject Was Roses, Glass Menagerie, Fear Strikes Out, Ordinary People, Who’s Afraid of Virginia Woolf?, or All My Sons – is the perfect framework to explore the thorny topic of mental illness in today’s America. Our overeager societal penchant for pharmacological solutions receives the most caustic critique, though the authors have plenty to say about gender, age, economics, and the medical profession writ large. The musical ends with an open-ended if nebulous note of hope, a hope that seems to rely chiefly on honesty, candor, risk-taking and acceptance as the true road to any mental recovery from a catastrophic event. Keeping in mind my admission that many of these folks are friends and acquaintances, the Two Muses cast, in my estimation, was uniformly excellent. With minimal staging, heartfelt performances, and a blessedly light touch, the six-person ensemble (Diane Hill, Nathan Larkin, John DeMerell, Aubrey Fink, Rusty Daugherty, and Richard Payton) delivered an exceptional show. Hill and DeMerell captured beautifully the delicate and painful dance of a couple perfectly wrong for one another, whose youthful good intentions have calcified into painful resentment. With expert direction by Hill and Barbie Weisserman (including additional staging by Frannie Shepherd Bates) and strong musical support from Jamie Brachel (and fully visible musicians sharing the stage with the actors), this production strips away any visual distraction, simply and effectively using lighting, movement, and a simple chrome dining table and chairs to evoke a wide vary of locations, moments, and emotions. So, here’s the punchline, Metro Detroiters. You only have one more shot to see this stellar production. Run don’t walk to the Two Muses website – www.twomusestheatre.org – and get your tickets for tomorrow (Sunday, June 30) afternoon. You won’t be sorry! Time plays such strange tricks with the mind. It feels like a week ago that I was in eighth grade hearing New Kids on the Block’s signature hit “Hangin’ Tough” for the first time. Or two days ago when BoyzIIMen’s “Motownphilly” rocketed across my car radio in college. Or yesterday when 98 Degrees (and an equally neophyte Christina Aguilera) contributed those requisite, catchy, and sometimes extraneous two bonus pop songs at the end of a mid-90s Disney animated musical, in this case Mulan. Don’t even get me started on Nick Lachey and Jessica Simpson’s more entertaining-than-it-had-any-right-to-be reality hit show Newlyweds…and, alas, we all know how that one turned out. They were doomed the moment Jessica feigned confusion over what “Chicken of the Sea” actually was. In her defense, it is a very odd and rather disgusting brand name if you think about it. 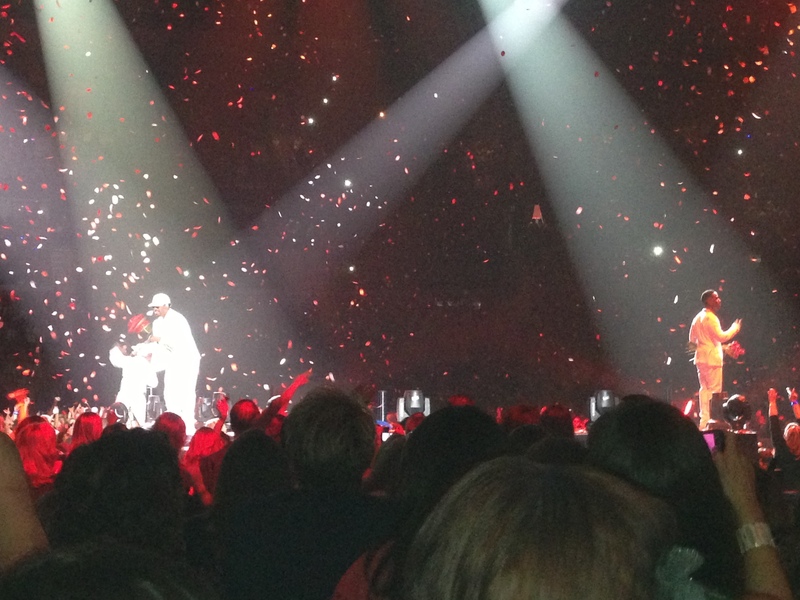 So last night The Package Tour with BoyzIIMen, 98 Degrees, and New Kids on the Block (now saddled with the unfortunately cumbersome, test-marketed acronym NKOTB) at the Palace of Auburn Hills was a surreal though vibrantly fun evening of music and wistful nostalgia. Neither these 40-something-year-old “boy band”-ers (wow, what a dumb genre name) nor their audience (myself included) are getting any younger. The singers still power gamely through the hits, even if the lyrics now make them (and us) wince a bit, and they move as if their knees and joints aren’t aching like heck. I found it difficult just to stand for three hours; I can’t imagine if I had been jumping from one fog-encased, hydraulic moving platform to the next. Evening openers BoyzIIMen were the strongest vocally, singing many of their hits a cappella without one sour note, truly amazing in an arena the size of the Palace filled to the rafters with screaming fans. 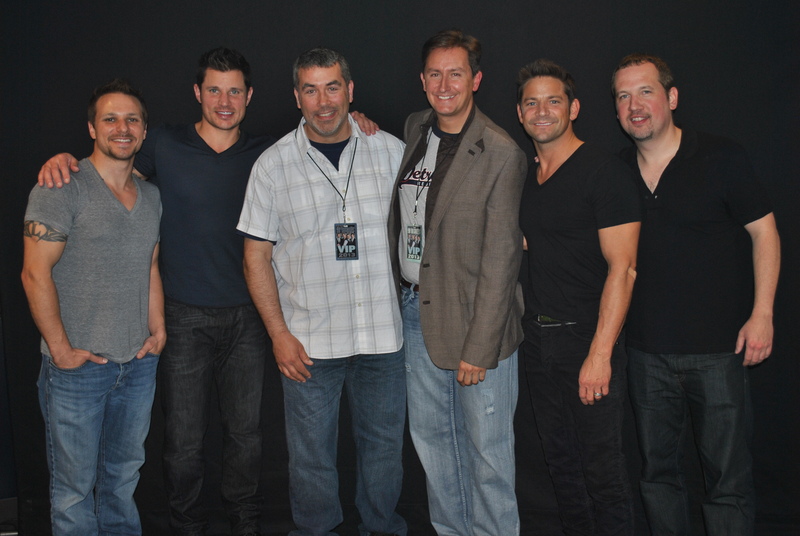 98 Degrees were charming as well. We had the added benefit of attending a meet and greet with the group before the show. They were gracious and authentic and kind to all. I was suitably impressed by how “un-star-like” they all were. As when I saw Shania Twain in Las Vegas a few months back, sat on the front row, and bonded with now friends Mike G. and Linda and Randy K., the close proximity to celebrities created an instantaneous, good-hearted sense of community. 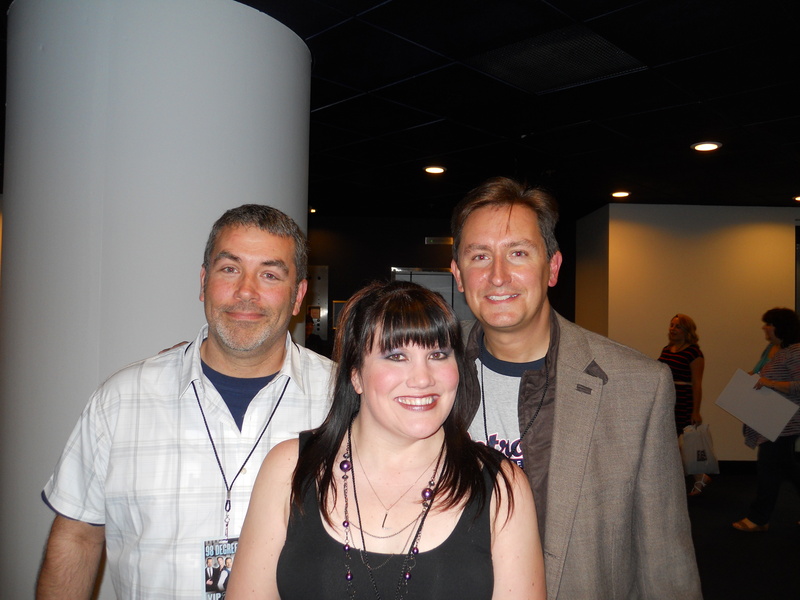 We befriended a 98 Degrees/NKOTB super-fan Katy from Cadillac, Michigan who showed us the meet-and-greet ropes. Why do I share this? As a testament to the band’s generosity of spirit, when Katy approached the table, Jeff Timmons, without missing a beat, shook her hand and said, “Hi Katy! Great to see you again! How is your son doing?” as if they were just catching up after running into each other in the produce aisle of their local grocery store. And in performance, this audience connection carried over nicely. For about an hour, Timmons along with brothers Nick and Drew Lachey (a Dancing with the Stars champ) and sometime politician and Occupy Cincinnati activist Justin Jeffre (seriously, he was even arrested!) worked the crowd, winking at their latter day reality TV personae that have eclipsed their days as pop music icons. 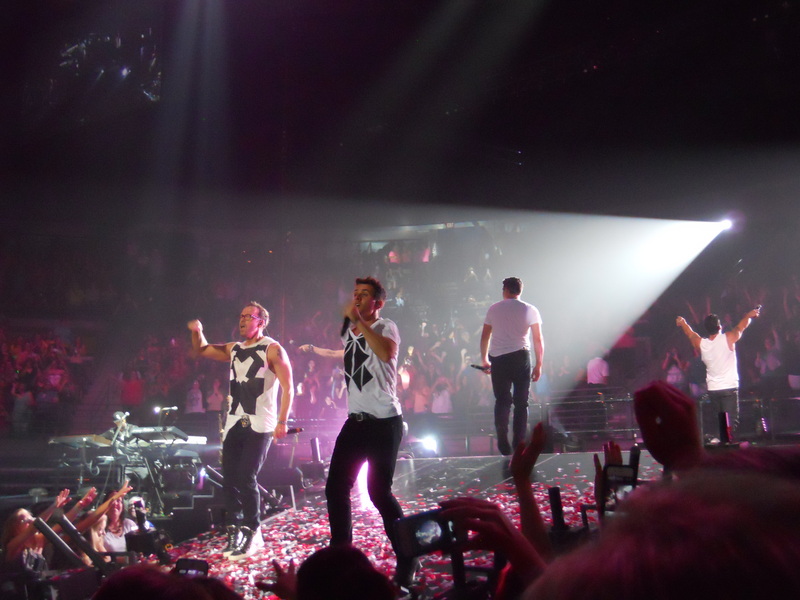 The evening was efficiently produced with no delays between acts, so, when NKOTB took the stage promptly at 9 pm, the crowd was in a frenzy. Donnie Wahlberg seems to have taken his place as ringleader with all the dynamics we’ve seen in his acting (he’s actually better than brother Mark in my opinion) now on display in his musical efforts as well. At times, it felt as if all the performers had watched Magic Mike a few too many times and had committed too much of Matthew McConaughey’s skeezy “hey ladies…” dialogue to memory. 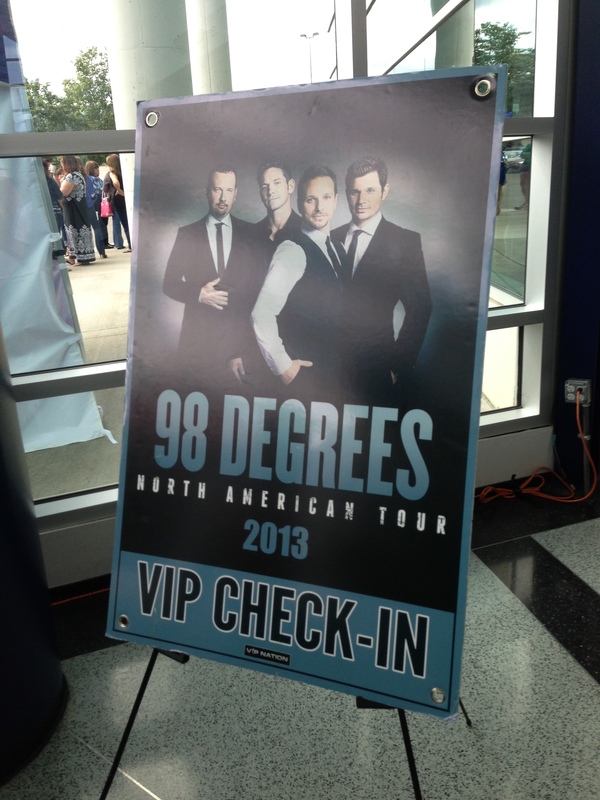 AND, minor quibble VIP Nation, but next time when folks sign up for the 98 Degrees “Meet and Greet” and you hand out the perfunctory gift bags, please have a few men’s t-shirts on hand. No matter how XXL the shirt, a woman’s tank top shirt is still a woman’s tank top shirt. And, no I’m not even using it when I do yard work. As a sure sign that we were old and attending what was in essence an “oldies” concert, we left early. Not because we didn’t love the show. We did. But our feet were tired…and have you tried to get through that Palace traffic at the end of an evening?